The ECCI plenary session brings to the attention of the communist workers of the world that, in the present extremely grave situation, under enemy fire, some formerly leading members of the Comintern have taken it upon themselves to make the most offensive and bitter attacks on the communist world party. Everything that the opposition leaders do helps to frustrate the important revolutionary tasks confronting us today. The fifth congress condemned Trotskyism as a pettybourgeois deviation-The seventh plenum condemned the opposition bloc as a socialdemocratic deviation. 1. Their hostility to and disparagement of the struggle of the Communist International against the war danger. The Trotskyists have turned their main forces not against the imperialist warmongers; according to comrade Trotsky, 'the greatest danger is the party regime'. With this slogan comrade Trotsky is in reality preaching reactionary defeatism, opposing his cause to the proletarian revolution. At the same time, despite repeated invitations to do so, he has not by a single word departed from his well known anti-Leninist position on basic questions of revolutionary tactics in the first world war. He confined his demands, already rejected more than once by the Comintern, to breaking up the Anglo-Russian committee, which at the present time would only enable the reformists, who are no better than traitors to the English working class, to realize their intentions. 2. Their evaluation of the nature of the Chinese revolution is basically false, contradicting all Lenin's fundamental ideas on the tasks of communists in a bourgeois-democratic revolution in backward semi-colonial countries. Their defeatist use of individual and partial failures of the Chinese revolution, particularly Chiang Kai-shek's coup, to spread a petty-bourgeois, liquidationist, panicky mood; their slanderous analysis of the policy of the CPSU and the Comintern up to and after the Shanghai coup, with the object of charging them with betrayal of the Chinese revolution. 3. Their complete political and organizational unity with expelled renegades from the KPD of the Maslow-Ruth Fischer group, whose immediate readmission to the Comintern comrade Trotsky proposed, and with the 'Information Bulletin' which the leaders of the opposition are constantly supplying with material. Thus not only the expelled ultra-left groups, but all other class enemies are being provided by the opposition leaders with a distorted account of the most secret affairs of the party which heads the proletarian dictatorship. The alliance of the Trotskyists with renegades of the Maslow type is particularly disruptive because the Maslow group are about to publish an anti-communist newspaper, are preparing to establish a separate party hostile to the Comintern and to create a counter-revolutionary 'fourth International'. 4. Their demand that the Comintern orient itself in the struggle against the war danger on anarcho-syndicalist elements (...) who are using the most despicable means to fight together with the worst white guards against the Comintern and the Soviet Union. 5. 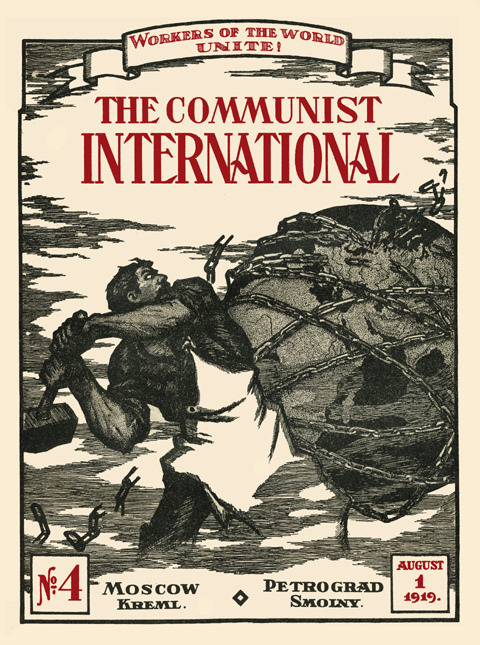 Their deliberate slandering and discrediting of the Communist International, which comrade Trotsky accuses of responsibility for the execution of Chinese proletarians; the Comintern leadership he defames as a body of bourgeois-liberals, 'spokesmen of the national bloc' against whose line he is fighting as against 'a shameful policy'. Deliberate slandering and discrediting of the Soviet Union, whose policy comrade Trotsky reproaches as 'national-conservative narrowness'. These attacks of comrade Trotsky are designed solely to shake the discipline of the bolshevik organization of the revolutionary proletariat, undermine its unity, lower its prestige among the working class, and unnerve it in face of its imperialist social-traitor enemies. Comrade Trotsky tried in vain to screen his menshevik attacks behind a veil of pseudo-radical left phrases, hypocritical assertions of his desire to submit to resolutions adopted, and dishonest proposals to 'regulate the conflict' in order to conceal his desertion from the communist workers. Comrades Trotsky and Vuyovich tried to disrupt the work of the plenary session of the ECCI, ceaselessly distributing fractional material hostile to the party, trying systematically to disrupt the work of the plenary session, and resorting to other disorganizing activities. The plenary session of the ECCI is taking place at a moment of the utmost gravity, of a critical sharpening of the international situation. The present international situation is characterized not only by a sharpening of class struggles in general, but in the first place by the immediate danger of a predatory military attack by the English imperialists and their vassals on the Soviet Union (...) by imperialist intervention against the national liberation struggle in China, and by a joint and savage attack of all the forces of reaction on the Comintern. Precisely at this moment comrade Trotsky and his adherents begin an obdurate struggle against the Comintern, the sole leading organ of the world revolution, and against the Soviet Union, the sole state-organized form of the world revolution. Precisely at this moment the Trotskyists fling accusations of treachery against the world party of communism, and charge the State of the proletarian revolution with degeneration. Objectively this attack of the Trotskyist opposition follows the same line as the attack of the bourgeoisie and their agents, designed to annihilate the decisive power centres of the proletarian world revolution. The plenary session of the ECCI replies to these sorties of comrade Trotsky, which are nothing but the desperate struggle of a few political deserters against the communist front of the entire world, with the firm determination to put an end to these splitting intrigues. The policy of the leaders of the opposition, as well as the character of their attacks, is tantamount to outright sabotage of the communist struggle against imperialist war. The conduct of comrade Trotsky and his ideological comrades is permeated with the spirit of solidarity with the renegades, the spirit of menshevism, half-way between the camp of proletarian revolution and the camp of imperialist counter-revolution. This half-way position, characteristic of Trotskyism, is criminal at the present acute stage of the class struggle. The Comintern recognizes the obligation implacably and finally to liquidate this ultra-left social-democratic tendency and to put an end to the unceasing hostile attacks of this group of bankrupt leaders. 1. The ECCI observes that both the principles and the conduct of comrades Trotsky and Vuyovich are incompatible with their position as member and candidate of the Executive Committee of the Communist International. 2. The ECCI categorically forbids comrades Trotsky and Vuyovich to continue their fractional struggle. 3. The plenary session of the ECCI empowers the presidium of the ECCI, in agreement with the ICC, formally to exclude comrades Trotsky and Vuyovich from the ECCI, if this struggle should not cease. 4. The ECCI proposes to the CC of the CPSU to take decisive steps to protect the CPSU from the fractional struggle of comrades Trotsky and Vuyovich.